The Color Run arrived in Clearwater, Florida again this December, turning the runners and the pavement a variety of bright shades. The 5k race, touted as the Happiest 5k on the Planet is a variation of the standard foot race in that the course has color stations. 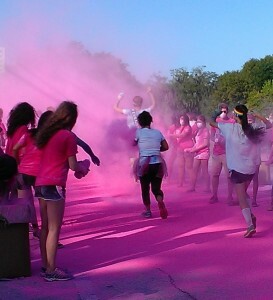 Each station holds a different vibrant hue of chalky dust, thrown at the racers when they pass. Set up like a gauntlet, race volunteers hurl or squirt day-glow powders onto the happy racers. This December’s race had four checkpoints, making the runners a living pallet of shades. 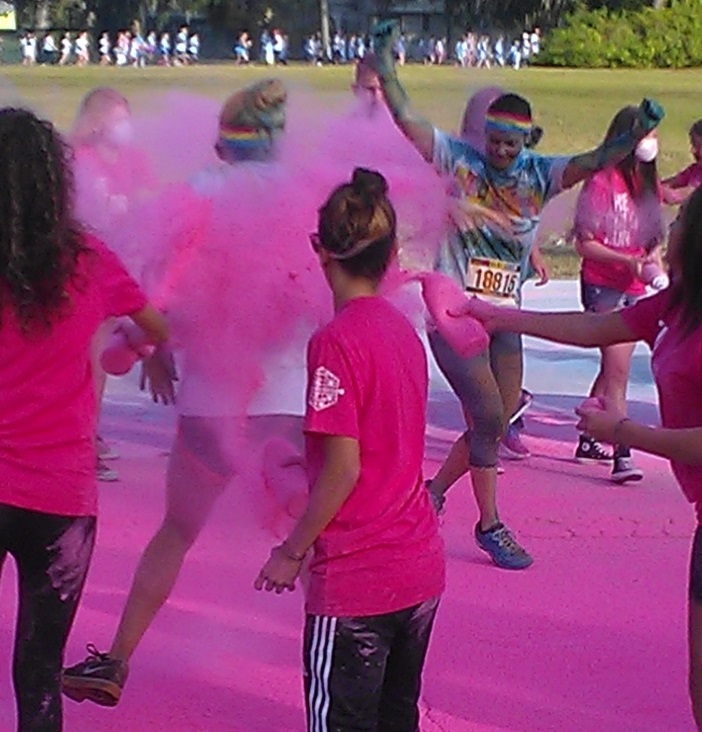 The Color Run painted the streets of Clearwater last year in January, making the gap eleven months rather than twelve. The turnout was just as good as last year, if not better. The streets were filled to the horizon on several Clearwater streets. Police helped with traffic at the corners, some, apparently, winding up with colors on their uniforms before the race was over. 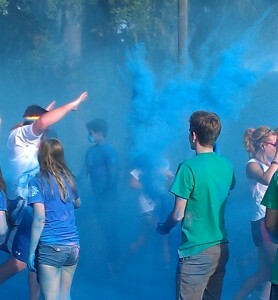 The Color Run was as good a time as always, with the racers smiling and waving as they went by. The volunteers also appeared to have fun pitching the powder onto to the runners. 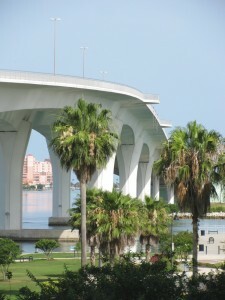 The race started and ended in Coachman Park, at the foot of the bridge to famous Clearwater Beach. The park is below the Clearwater Public Library, and next door to one of the trolley stop that takes tourist to see Winter the dolphin from the Dolphin Tale movies. The park is on the waterfront, with a dock and marina, making Coachman Park a great place for any event. An after-party happens each year on the park grounds, where anyone missing some colors on their clothing or hair is finished off. Plenty of race day souvenirs are available on-site. The park provides a perfect party-like atmosphere to end off the lively Color Run race. Clearwater is a great destination for a Florida vacation, with some of the most famous beaches in the USA on its doorstep. Nearby, visitors can find Fort De Soto Park, St Pete Beach, Clearwater Beach, Honeymoon Island State Park, and Caladesi Island State Park. The City of Clearwater is one of the big three of Tampa Bay, the other two being Tampa and St Petersburg. It is a lively metropolitan area that has great fishing opportunities, nearby wilderness, and fantastic resort beaches. 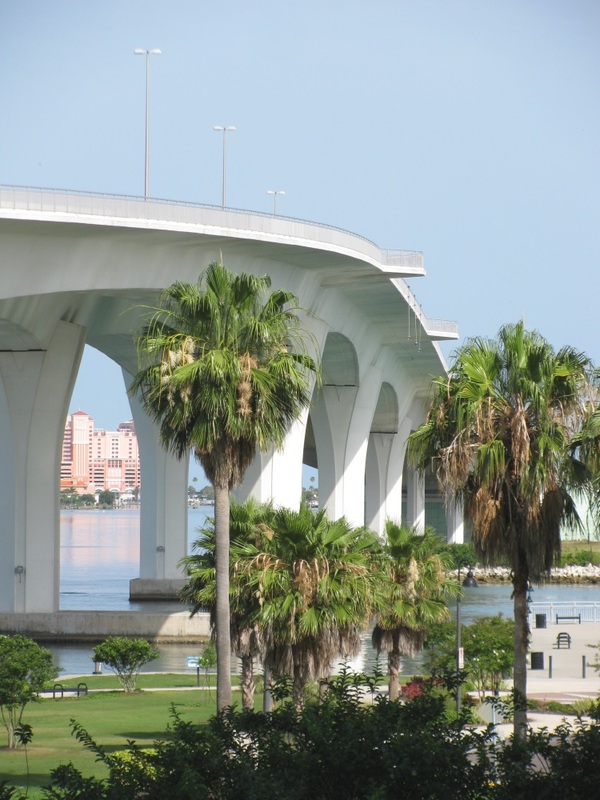 It is easy for visitors to find the attractions that make them happy in Clearwater.